Failing to take all of prescribed medications (non-compliance) is a problem facing millions of Americans every day. An estimated 10-25% of all hospital and nursing home admissions are due to non-compliance. For the 50 million Americans who have chronic hypertension, non-compliance can result in heart attack, kidney damage, or stroke. If you, or a loved one are at a risk of confusing or forgetting the amounts of medications to be taken every day, then Beacon Prescriptions has the solution you need. Beacon Prescriptions on 25 Collins Bristol, 57 South Bristol, 25 Mellen Bristol, East Haven, New Britain, and Winsted offer specialty packaging that takes the guess work out of taking medications. Our specialty packaging allows people to get the maximum benefit from their medication. 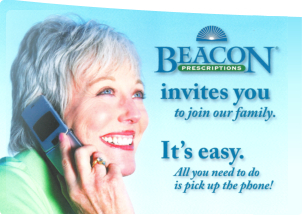 Call Beacon Prescriptions today to discuss how you can be set up on our Specialty Packaging Program. We will deliver your medications to you – for free! For our Med Box patients, never worry about calling your pharmacy for refills again. We automatically contact your physician’s office about refills. How Does Specialty Packaging Work? Med Boxes – offers a simple solution for people on multiple medications taken at multiples times during the day. This convenient box is delivered to you will all of your medications grouped by when they need to be taken. Now you can see if you forgot a medication with a quick look! All directions are clearly printed in easy to read type. For your convenience we offer FREE delivery and Medication Synchronization. It’s easy to setup, just ask our pharmacist how! Your Beacon Prescriptions Pharmacist: A resource for caregivers who want to make sure their patients follow doctor’s orders. Who needs special packaging? Nursing homes. Long-term care or elder daycare facilities. Visiting nurses. Even family members responsible for a relative who requires regular medications. All caregivers can benefit from the convenience and quality assurance of this service. Each patient has unique medication demands. Often, they need more than one drug. And when you multiply then umber of patients, you can see why it is crucial to have the right medicines ready at the right time. That’s why we’re your Beacon for special packaging: Putting each patient’s medicines in handy blister packs or medication planners. You are assured a thorough check for accuracy and drug interactions. You won’t find this service at just any pharmacy — including some of the biggest chain stores. It’s one more way your Beacon pharmacist goes the extra mile — taking the stress and guesswork out of handling multiple prescriptions. How does it help nursing homes? Nursing homes are required by law to package most drugs with specific information, including lot numbers and expiration dates. So they need separate bubble packaging for each drug. Nurses can administer medications, but don’t have a license to dispense drugs. That’s why every medication has to be individually marked and packaged. Big nursing home facilities get their medications from big, institutional pharmacies – often, they’re the only game in town. That’s the expensive route. Beacon Prescriptions provides special packaging for any drug, in single- or multi-dose blister packs, for up to four drugs per package. How does it help group homes? Group homes (i.e., for people with mental retardation) usually don’t have nurses on staff. Here, packaging takes the human error out of dispensing medication. For example, we can create one package for the patient’s morning pills and another for the evening. If the patient goes home on weekends, we can package prescriptions for the five weekdays. How does it help visiting nurses? Visiting nurses can bring all the prescriptions for their many patients to us. That means they can spend less time chasing down prescriptions and more time visiting and nursing. Can individuals take advantage of this service? Yes. If you’re caring for someone who takes several medications on a regular schedule, this service can simplify your job. You can count on the correct medicines and dosages, ready whenever they are needed. How can I be sure about accuracy? Our staff includes certified specialists, specially trained for this painstaking work. And of course, you get Beacon’s guaranteed check for drug interactions. Everything we do is designed to save your time and make your work easier. First, we tailor a totally customized plan for each patient. Second, we know the regulations and make sure they are followed diligently. Third, we can deliver the packaged drugs to you every week — or whatever schedule you need. We can provide 24-hour turnaround upon request. Fourth, our Accounts Receivable service is designed to handle billing for group or nursing homes. We can provide private monthly billing upon request. Above all, we have proven experience and expertise — and a reputation for fast, friendly, accurate service. You’re looking for a better way to serve all your patients. We’re your Beacon. Please contact Bristol (Collins Rd. ), Bristol (South St.), East Haven, New Britain, or Winsted locations for these products and services.